Bringing home a puppy is huge decision that will last for many years. We know our puppies are some of the best and brightest Goldendoodles available. We want to help you make your decision by providing you with the most information that we can. Our puppies are highly socialized, well nourished, and have already begun a house training regime. Our puppies are raised in homes, so they know how to behave in homes. They are happy and healthy and we know that our quality and our puppy practices set us apart from our competition. please fill out our Puppy Application! We believe that the health of our puppies is the most important aspect of them. Our puppies receive their health certificate from my veterinarian at 8 weeks old. He checks for any abnormalities everywhere - eyes, ears, bones, teeth, joints, bones, and stools! Puppies also receive immunizations and are sent home completely up to date with their certificate. We want to make sure you get to know your puppy before they come home with you! In order to keep our puppies as healthy as possible, we make an individual video profiles of all the puppies and include a personality and physical trait description. We believe the videos are the perfect way to help you make your decision since you can see every inch of your potential new family member! Although we try to make the decision as easy as possible for you, we understand that these little fluff balls are so adorable that choosing just one can be very difficult. These videos allow you to see them in action so that you can select the perfect puppy! Selections are made in order of deposits received, while you can tell us your preference - we cannot guarantee gender. Puppies go home at 8 weeks old. If you are not able to pick up your puppy at that time, we offer additional stay for a fee. Love My Doodles reserves the right to first pick of any litter. Our puppies begin a house training regime very early and are nearly 100% house trained by the time they come home. We begin by paper training each puppy by the age of five weeks. Of course, they are still babies but for the most part they do make it on the paper and never eliminate in their sleeping quarters. I believe this gives them the best start on house training! This also instills on them the idea that rules must be followed! By week six when they are a bit more developed, they begin going outside for potty training basics. They learn that outside is where the potty party happens and by week 8, they are pretty confident in their knowledge. I provide very informative instructions on our routine to insure their progress continues in their new homes. I am happy to help every step of the way! Every puppy is held, played with, and loved on throughout the day. Family members, both adults and children, come over to socialize and the puppies love it. The puppies are around adult dogs, other puppies, and even cats! We like to encourage intermingling at a young age so that they don’t become too shy around other dogs. The puppies play with Daddy from around 6 weeks old too! Our puppies have a combination diet of high protein dry puppy food (Diamond Naturals), raw organic carrots, and raw organic beef and venison. 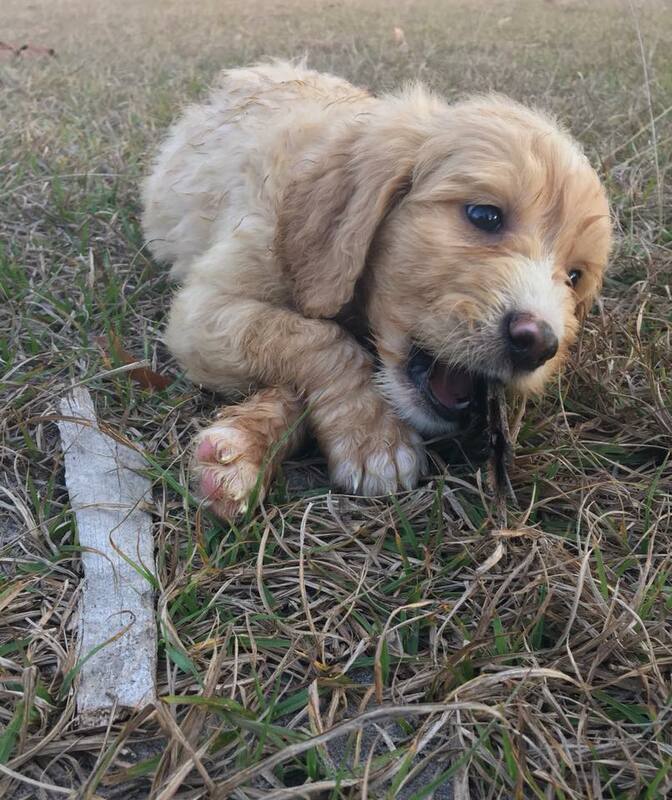 By 5 weeks old our puppies begin chewing on raw bones to build strong bones and eliminate tarter build up. Each puppy is sent home a bag of Diamond Naturals food (small or large breed puppy included in their puppy package). Each one of our puppies is sent home with all the basics for the first few days. Included is a bag of their current food (Diamond Naturals), natural treats, puppy pads (just in case! ), toys, leash and collar, potty bell, and a blanket that smells like mom to help with the separation anxiety of being away for the first time. Microchipping paperwork is provided, make sure you register your puppy right away! Puppies are just like furry babies! They go through teething just like us! 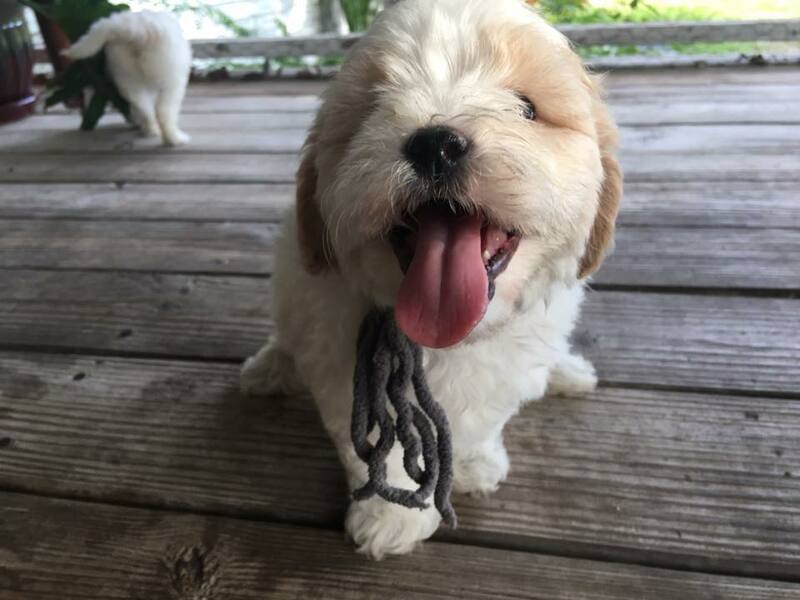 The best way to avoid having your puppy chew on something it shouldn't is to always have other (more fun!) things to chew on! *Puppy pads for the first week!